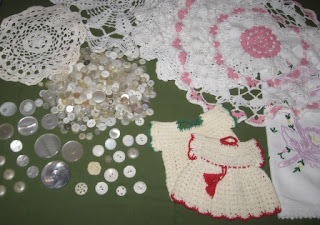 I have been buying lace dollies and napkins at the local thrift store for a fiber kit. This is one days finds. I also bought some buttons for myself. The little dresses are so cute. I am going to keep them for something special, not sure yet. Update later in the day. June tells me the little dresses are Ornamental Pot Holder. I thought of them as kitchen ornaments. Here is a start to the dyed goods. I have many dollies and napkins done. 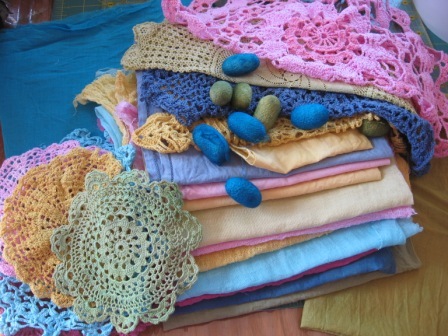 Also in the photo is some silk cocoons and many cotton sheer pieces dyed. I will be adding more dyed goods and make up kits. I did some dyed fiber kits at a booth last year and sold out in the first day. I will have to get a photo done with a few of the kits done up together. I plan to have some colour themes, fall, spring, green, jewel, and neutral. Great for a mixed media fiber art project. Sounds like fun doesn't it.